Thanks for the fun buttons magnets at both Comic-Cons this year. Also? Fantastic job with the CN Lounge at NYCC. Great team, very well-designed decor, and it ran like a little machine, that area. 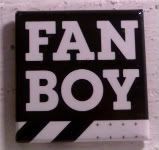 Anyway, I'm not sure what the gender breakdown is for Comic-Con - either in SD or NY - but next year, don't forget to bring Fangirl/Fangurl buttons magnets with you to give away. Fanboys are supercute and all, but us Fangirls should get equal play. I'm just sayin'.